What Ovid can teach West Point plebes about their lives as soldiers and storytellers. To teach is always to be in the middle of the next story. This realization strikes me anew every autumn, as the days lose more light and my students accelerate into the end-of-semester scramble. Then, suddenly, it’s finished. But, as the old year breathes out all around me in a welter of regret, missed opportunities, and diminished returns, I already have my eye on the next class, the next batch of students, the chance to do it all again—maybe better. The story I’m weaving just now concerns the more than 1,100 West Point plebes enrolled in next semester’s introductory literature course, whose current incarnation I designed. Among the authors the plebes will confront in the new year is the Roman poet Ovid, who sets out in his epic Metamorphoses to narrate the history of change since the origins of world: chaos into cosmos, human beings into beasts and (sometimes) back again. The plebes are themselves poised to enter a world rife with Ovidian volatility, uncertainty, and surprise; the transformations they are undergoing—and will continue to undergo—only seem less radical than the fantastic metamorphoses Ovid recounts. Wrestling with the poem’s exuberance offers them a chance to begin accommodating themselves to the strange new world they have joined and to the intricate network of stories informing it. Over the holidays, at home with their families really for the first extended period since arriving at West Point last June, the plebes are being confronted by the fact that, no matter how familiar home may feel, they are nevertheless in some ways newly estranged, reshaped by their experiences. They may have an uneasy sense that some of the things they had long assumed to be straightforward truths turn out to be stories that no longer fully persuade. Similarly, some of the West Point truths they report to their families, in fact, form the components of a new mythology, which they, eager apprentices in the art of the “war story,” do not yet fully recognize as such. After all, to attend West Point is to enter the misty world of legend: Everyone from Edgar Allan Poe, briefly a recalcitrant cadet, to Robert E. Lee, who graduated without a single demerit—he waited a few years to break some rules—plays a part in the romantic mythology of the Long Gray Line. Yet these are only some of the tales with which plebes must reckon. Our current engagements overseas present them with even more: stories without the clarity imposed by time’s passing, stories that confuse because they lack the definition of an ending. Having only recently begun a military career, plebes tend to depend heavily on others’ stories. They eagerly play the roles that someone else constructs for them. Momentous career choice once made, they come to believe that they have ceded control over their own narratives. How easy it can become to let a uniform, with all its signs and signals, tell their story for them. It is my hope, then, that the plebes’ introduction to literature, particularly to Ovid’s Metamorphoses, will equip them with the ability to interpret the stories they have (often unwittingly) inherited as well as with the ingenuity to create new ones. Ovid is one of literature’s wiliest fabulists; his is no systematic chronicle. His poem’s structure mirrors the shape-shifting instability of the world it depicts, one in which chaos always threatens to rend the universal order to which it gave birth. The narrative itself often misbehaves right along with its protagonists. Perhaps a story refuses to end or is interrupted by another tale only to resume later; sometimes one story—maybe naturally but often quite arbitrarily—becomes another one altogether; often tragic and comic elements comingle. Ovid’s world is one in which even form and matter threaten to dissolve before our eyes: A boy who happens to be the son of Phoebus the sun-king borrows his father’s chariot and nearly incinerates all creation before plunging like a comet headlong from the sky. 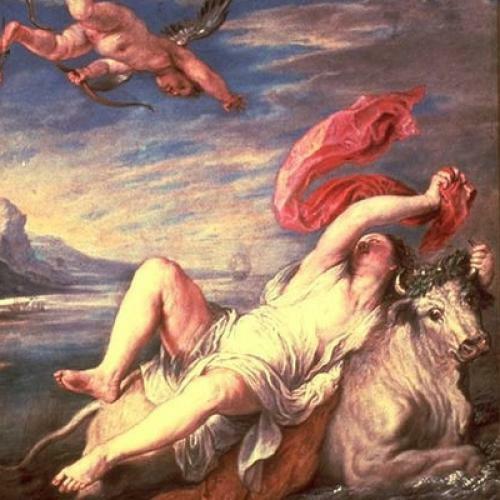 A girl, pursued by lustful Jupiter, is transformed by his jealous wife Juno into a cow terrified by the sound of her own incomprehensible lowing and left to scratch the story of her terrifying abduction and alteration in the dirt with a hoof. A man who founded a kingdom by killing a venomous serpent and sowing the fields with its teeth cries out in despair at the litany of misfortunes that have since befallen him; in his grief, he becomes a serpent himself, destined to dwell, in the company of his similarly transformed wife, in an Illyrian grove—a pair of genial snakes living in peace with human beings because they remember who they used to be. After reading these myths, the plebes will be asked to invent one of their own: to unleash their unpredictable, insufficiently exercised creativity in the modern reimagining of an ancient metamorphosis. By setting a shape-changing episode within the known worlds of home, high school, or West Point, the plebes will learn how to make the familiar strange and thus to recognize more clearly the lineaments of the stories that surround them. In transplanting Ovid to new soil and exerting some measure of control over a narrative—complex, contradictory, and alien though it may seem—they will begin their own transformation from consumers into authors of myth. Maybe it happens when we finally escape from home—go to college, join the army, go to war, watch a friend die unnaturally and too soon. Or perhaps it doesn’t happen until we return home again, years later, from whatever new world we’ve joined and in the guise of whatever new self we’ve fabricated to live in it. But, one day, we awaken to the realization that the plot of our life wasn’t quite what we thought it would be, that its very genre has transformed before our eyes—perhaps comedy has become tragedy, tragedy comedy, or romance satire. That’s the moment when we have to improvise, when we must determine how hard to fight for the rights to our own story. We must identify who wrote the myths by which we have been living and decide which ones are worth keeping. What will my students do when they awaken one day to discover that the narratives they’ve woven in order to get up in the morning have lost the power to shape experience? Maybe that day will arrive at a time when they can ill afford it, in a hostile place where they are responsible for others as well as for themselves and where there is little luxury to think about anything but survival. Perhaps on that day they will remember what it was like once, as plebes in the throes of their own disconcerting metamorphoses, to grapple with the ungovernable in Ovid, to behold the liberation and pains of turning into something new, to chase down the stories whose ends insist on eluding us. Elizabeth D. Samet is a professor of English at the U.S. Military Academy and the author of Soldier’s Heart: Reading Literature Through Peace and War at West Point. The opinions she expresses here are her own and do not necessarily reflect those of the Military Academy, the Department of the Army, or the Department of Defense.